Of course I’m still down in the dumps about my Rosie, but February has always been a tonic for me, as it’s always been the month for bluebirds andNarcissus. With bluebirds being the “songbird of happiness” and the genusNarcissus gaining its botanical name from the same source as narcotics, one can understand how February would be a salve for the soul. There’s even a bluebird warbling outside my window as I write this. On February 4th, SFA Gardens sponsored the Texas Bluebird Society’s annual season kickoff on the SFA campus. Almost 200 folks attended and were treated to lectures, lunch, door prizes, and a silent auction fundraiser for the society. I gave two talks; one on how I fell in love with bluebirds and the other on how to landscape your property to attract them. The ever spunky Linda Crum entertained and horrified the crowd with her detailed recipes for disposing of noxious European house sparrows. They of course take nesting cavities away from our native bluebirds as well as killing the bluebird young on the nest. Friend and Texas Parks and Wildlife ornithologist Cliff Shackelford taught us all about our eight species of East Texas woodpeckers. Woodpeckers are primary cavity dwellers and historically provided most of the nesting cavities for bluebirds. Without standing dead trees, there wouldn’t be woodpeckers and without woodpeckers there wouldn’t be bluebirds, titmice, chickadees, nuthatches, wood ducks, and the many other secondary cavity dwellers that make up the amazing natural world around us. Remember that, when deciding what to do with the multitude of dead trees we now have in Texas. They are just as much a part of nature as live trees. Also remember that bluebirds are birds of open spaces like pastures, prairies, lawns, and cemeteries; not forests. In addition, they eat insects during most of the year (not seeds) and berries during the winter. The two plants I see bluebirds dining on the most around here during the winter time are hackberry trees and possum haw hollies. 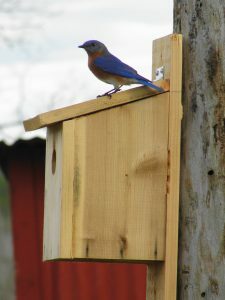 To learn more about bluebirds in Texas go to texasbluebirdsociety.org. EDITOR’S NOTE: Linda Crum teaches classes at The Arbor Gate regularly. Check our Class schedule for more info! The majority of my spring bulbs bloomed (as usual) during February. 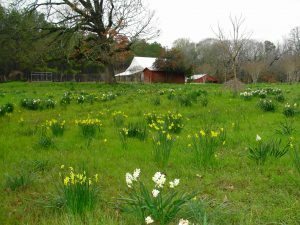 Most of our successful Narcissus in Texas are in the early blooming category, when temperatures are are mild and they have time to ripen their foliage. Always remember that this year’s foliage produces next year’s flowers. I mostly grow heirloom types that return and bloom year after year and never need dividing, fertilizing, or watering. All they need is full sun, wet winters, and dry summers. My palette is mostly comprised of sweeties (Narcissus jonquilla), Texas star jonquils (Narcissus x intermedius), campernelle jonquils (Narcissus x odorus), Grand Primo narcissus (Narcissus tazetta ‘Grand Primo’), lent lilies, (Narcissus pseudonarcissus), and butter and eggs (Narcissus x incomparabilis aurantius plenus). The simplest way to categorize the different types of Narcissus that grow here is this. If it has small golden yellow flowers in clusters, a heavenly sweet fragrance, and roundish dark green leaves, it’s a jonquil. If it has white or creamy white flowers in clusters, a loud obnoxious perfumed outhouse smell, and wide dark green foliage (gray-green in paperwhites), we simply call it narcissus. And if it has yellow (rarely white) single flowers on a stalk with an extended trumpet-nose in the middle, little fragrance, and wide blue-green foliage, it’s a daffodil. If what you see even remotely fits into one of those categories, shove it in there and slap the name on it! Keep in mind that the majority of our successful perennialNarcissus here are early blooming, small flowered, heirloom species and early hybrids. The least successful are the giant flowered “King Alfred” type daffodils. These have to be regularly divided and fertilized to keep them blooming. Daffodils weren’t meant to be garden monstrosities, they were meant to be the naturally sweet flowers that Wordsworth wrote about. Consulting forester, Dr. Todd Watson, spoke at our February Les and Theresa Reeves lecture series at SFA. He taught an enthusiastic crowd everything about selecting and planting trees and pointed out that there are many trees being planted too deep with the root flare buried, leading to slow growth and eventual death. If you see a tree that looks like a fence post sticking in the ground without a spreading base, it was either planted too deep or has been covered with fill dirt. Both are a death sentence. 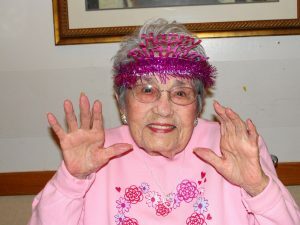 On February 18, I attended my great-aunt Golda Punkeny’s 96th birthday party at the nursing home in Center. She is one of my late Papaw, Eloy Emanis’, younger sisters. Her daughter, Pam Vance and husband Richard, are my good neighbors. I played old four-part harmony Baptist hymns on the piano at the party while all the relatives sang along. I’ve always loved those songs since attending church and Sunday singings with my grandparents in the country as a child. On February 22, librarian friend Debra Bashaw had me speak to her Huntington High School book club on the importance of native plants and the horticultural contributions of our ancestors. I gave them all four leaf clovers and left as a Burbankian horticultural wizard. 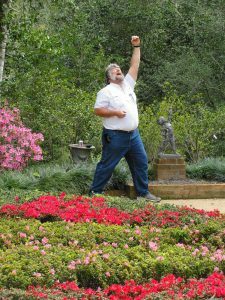 Finally, the last weekend of the month I attended the Texas Association of Botanic Gardens and Arboreta meeting at Bayou Bend where friend and former student Bart Brechter and the historic River Oaks Garden Club treated us to a wonderful meeting and even more wonderful local tours. I got to see many old friends and especially enjoyed seeing the “big guy”, Steven Chamblee, from Chandor Gardens in Weatherford. He’s a special hoot and will speak at our lecture series in April. I think I was the only one there that has worked at three different Texas botanical gardens (San Antonio, Mercer twice, and SFA at least three times!). Next month brings the free open days of sweet friend Thera Lou Adam’s H. Nelton Adam’s Memorial Daffodil Field at Dodson, Louisiana March 2-4, the SFA Gardens Azalea Symposium March 10th, my control burn at the Rebel Eloy Emanis Pine Savanna and Bird Sanctuary the week of spring break, the hopeful arrival of my new Growing Fruits and Vegetables in Texas book (coolspringspress.com and amazon.com) on March 17, Dr. David Morgan on Growing Grapes in East Texas at our March 22nd SFA Gardens free lecture series, and the SFA Ruby M. Mize Azalea Garden Little Princess Tea Party andAzalea Trail March 31st. For more information see sfagardens.sfasu.edu. Until next month, be happy and grow old gardening. Greg Grant is an award-winning horticulturist, conservationist, photographer, and writer from Arcadia, Texas. Each month he writes an article for The Arbor Gate Blog where he is given free range to write about any topic that interests him. During the week, he is the Smith County horticulturist in Tyler for the Texas A&M AgriLife Extension Service and on the weekends, he and his wife tend Greg’s grandparents’ old farmhouse, his Rebel Eloy Emanis Pine Savanna and Bird Sanctuary, a small cottage garden, a flock of laying hens, four terriers, one German shepherd, and two cats. Hello Mr. Grant, I came across your article when I searched for a wonderful lady I knew growing up, Mrs. Gold Punkeny. I lived across the street from Mr. and Mrs. Leroy Punkeny in the early "80s in Red Oak, TX. At the time I was about 8 years old. I had a humble upbringing and my family did not have much. I remember Golda was always ready and available to help my family. I remember going to Golda's house on many occasions to use her phone. Never once did she say "no" she always received us in her home with a kind and authentic smile. There were a few times when she picked me up from school when I was ill as my mom was young and did not know how to drive. My mom did not speak English, but somehow Golda understood her. I also remember her vegetable garden. She would bring us fresh okra all the time. If memory serves me correctly, I think it was Golda who have me my first pet dog, Spike a bull terrier that I had for 7 years. I can keep going, but I wanted to let you know that your great aunt Golda was an excellent kind woman with a gigantic heart. If Golda is alive and doing well, I would love to contact her.